Preparations for the Euro 2012 football championships, which Ukraine is set to co-host with Poland, have been mishandled and could result in a foreign debt catastrophe for Kyiv, independent experts have warned. With the winter season approaching, Ukraine and Russia have reignited old tensions about gas pricing, in a row reminiscent of the trade dispute which ended up leaving parts of Europe cold in 2006 and 2009. Gazprom CEO Alexei Miller announced yesterday (6 September) the number of shares that EU companies will take in Russia's South Stream pipeline project, which is designed to deliver natural gas directly to Western Europe under the Black Sea. Russian Prime Minister Vladimir Putin said yesterday (5 September) that his country would begin pumping the first technical gas through the Nord Stream natural gas pipeline from today, so that European clients could start receiving supplies in October or November. Ukrainian President Viktor Yanukovich plans to take his modern and dynamic country much further down the path to becoming a "proud member of the European Union," he revealed in an editorial for the Wall Street Journal. As of next year, Ukraine will lift a moratorium on the sale of agricultural land, a move seen as an important step in opening up the country to potential foreign buyers. But legislation that would establish a truly modern land market is still lacking. The European Commission appears ready to seal a trade agreement with Ukraine by the end of the year, giving Kyiv a helping hand in countering Russia's growing pressure on the country. However, uncertainty remains high. Ukraine, embittered by Russia's unwillingness to cut prices for its gas, said on 12 September it would try to resume imports of the fuel from Turkmenistan. Prime Minister Mykola Azarov called today (7 September) for Ukrainians to keep their doors and windows tightly closed, to store energy and to save on gas because of Ukraine's "enslaving" gas contract with Russia. As the European Union prepares to disburse additional grants to Kyiv under its new 'Endowment for Democracy' initiative, several key personalities in the ruling Party of the Regions have voiced hostility toward foreign aid, saying it "provokes unrest" and "weakens" the country. Vinnytsia, a Ukrainian region bordering Moldova, became the country's first to present its various advantages to the EU's Committee of the Regions in Brussels this week. Despite being an "absolute beginner" in the lobbying field, the Ukrainian region made a strong case for the country's EU accession. Ukrainian President Viktor Yanukovich has made visa-free travel to Europe one of his country's top priorities. However, the EU is wary of a public opinion backlash and is linking the issue to improvements in Ukrainian democracy and the country''s judicial system. Ukraine is dedicated to concluding its free trade negotiations with the EU - without joining Russia's project for a Customs Union with Belarus and Kazakhstan - and hopes Japan and other nations will heed the lessons of Chernobyl as they deal with the aftermath of Fukushima, says Ukraine's Deputy Economy Minister Valery Piatnitsky in an exclusive interview with EURACTIV Germany. Where did Ukraine’s Yushchenko go wrong? Five years ago, Ukrainian President Viktor Yushchenko was swept to power as the father of the pro-Western 'Orange Revolution' but is now facing defeat as he bids to win a second term in presidential elections due next Sunday. Reuters' Richard Balmforth asks where it all went wrong. Ukraine since independence has been marked by economic difficulties and political corruption, but the development of market elements will in time encourage positive changes in the political system, argues Ivan Matiyeshyn of People First. Central and Eastern European gas markets have long suffered from isolation and fragmentation, leaving them vulnerable to both supply disruptions and to monopoly pricing power. However, new research suggests that countries collectively negotiating with gas exporters could remedy this problem, argues economist and energy researcher Edward Hunter Christie. Social networks can act as a catalyst to help direct democracy prevail over current economic and political monopolies, writes Viktor Tkachuk from the "People First" organisation in Ukraine. A multilevel Europe is both a chance for the EU to survive and return to economic prosperity, while for Ukraine it opens new chances to get closer to the Union and envisage a shared future, writes Roman Rukomeda from Ukrainian foundation 'People First'. Iceland and Ukraine, two countries that aim at joining the EU and that both had their former leaders prosecuted for abuse of authority, seem to be treated in a completely different way, writes Kost Bondarenko of the Institute of Ukrainian Politics. A visa action plan adopted at the recent EU-Ukraine summit is a success for Kyiv, but the hardest task will be meeting the European Union's expectations on democracy, tackling corruption and the rule of law, writes Marta Jaroszewicz from Polish think-tank the Centre for Eastern Studies (OSW) in a February commentary. The Euro 2012 became a genuine festival of people-to-people contacts and cultural exchange in a wider United Europe by taking place in "undiscovered territory" - Ukraine, Kostiantyn Yelisieiev say in an op-ed first published in The Guardian. Only a short time ago, nobody believed Ukraine could deliver on Euro 2012. In the event, Ukraine rose to the challenge and, together with Poland, hosted one of the most successful tournaments ever. Now Ukraine’s leadership must rise to another challenge. It must demonstrate in actions rather than words that it is committed to European integration, argues Amanda Paul. Public dissatisfaction in Ukraine is rising but – paradoxically – it is “non-political”. Public willingness to join protests grow not because of the political situation, but due to worsening economic conditions, says Wojciech Kono?czuk. The elections in Ukraine: What’s next? The Ukranian Parliamentary elections on Sunday (28 October) will not trigger improved relations between the EU and Ukraine. In fact they could make them worse, says Roman Rukomeda. The North African revolutions have turned the review of the European Neighbourhood Policy into a stormy debate, writes Katarzyna Pe?czy?ska-Na? ?cz in this analysis. However, Europe should at the same time reconsider its ties with some of its eastern authoritarian neighbours. Ukrainian authorities might have problems forming even a simple majority after the general election. The Party of Regions' apparent election success is in fact a pyrrhic victory, says Sonia Koshkina. The simple expectation from the Ukrainian authorities that the EU won't let Ukraine transformation into a new Belarus allows the current Ukrainian administration to manipulate the position of official Brussels in favour of itself, says Viktor Tkachuk. I am amazed by the current discussion about the EU–Ukraine Association Agreement, about when, where, why to sign it or to sign it all in all. It’s a total confusion of goals and means and nobody is talking about it, neither in the EU nor in Ukraine, writes Pavlo Klimkin. The austerity measures introduced by the current government have brought many people to the streets to defend their social rights, and the belief that Slovenia should remain firmly grounded on the premises of a modern welfare state, writes Marko Bucik. EU-Ukrainian Association Agreement: To sign or not to sign? The leak of the EU-Ukraine Association Agreement (AA) turns the focus of their relations to a Shakespearean question: to sign or not to sign. And since Ukraine is ready to sign, it puts the onus on the EU, in the complex geopolitical games of Russia, Europe, the US and other influential international players, argues Roman Rukomeda. Today, it seems that one seeks to artificially impose a choice on Ukraine: either favour the EU or the Russian-led Customs Union. The myths are exaggerated in Ukraine and obviously go beyond borders, getting to the ear of our attentive EU partners, says Kostiantyn Yelisieiev. A law was recently adopted in Ukraine allowing constitutional change by referendum. The law should be carefully welcomed by the EU, argues Bruno Vandecasteele. With oil majors waving billions of dollars around, President Viktor Yanukovych’s party is eager to tap Ukraine’s shale gas deposits. Political foes are no less eager to make hay of the controversial technology, writes Ivan Lozowy. Since Vladimir Putin’s return to the Kremlin in 2012, the EU's relationship with Russia has become increasingly strained. But both sides should realise the necessity of strategic economic cooperation, starting from the regional level, Denis Maksimov writes. The European Union and Ukraine have been long-negotiating an Association Agreement tied with an unprecedentedly far-reaching free trade deal. At stake is not only the economic partnership, but also the country's political future, caught between historic ties with Moscow and uncertain prospects of prosperity and 'Europeanisation' with Brussels. 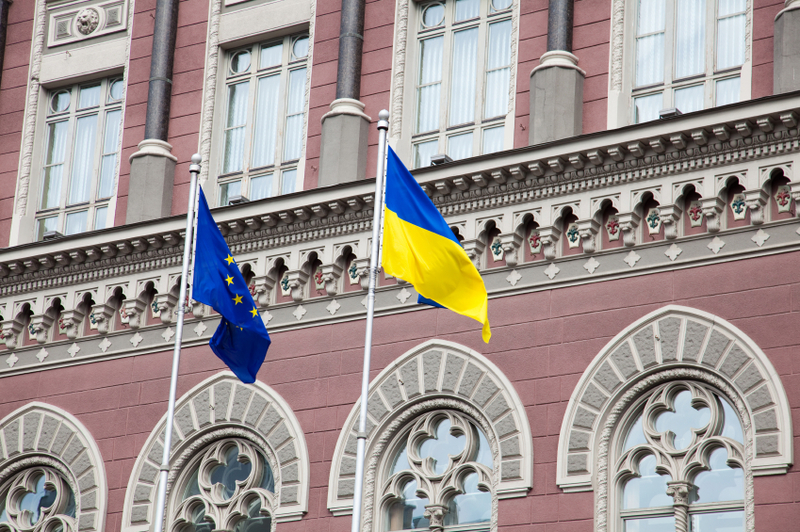 Ukraine and the EU: A vicious circle? Countries that managed to accede the EU did so "by observing a few simple guidelines," according to writes Tomas Valasek, director of foreign policy and defence at the Centre for European Reform: "cultivate friends among EU governments, be prepared to make painful sacrifices and, above all, show patience and good faith". But Ukraine "has broken every one of those principles over the past two years," his November paper claims. Ukranian President Viktor Yanukovych must come up with a clear, strategic plan as soon as possible in order to face the country's political and economic challenges, says Amanda Paul of the European Policy Centre in Brussels. EXCLUSIVE / Lithuanian President Dalia Grybauskait? yesterday (5 November) warned Russia to stop its ban on Lithuanian dairy products or face EU action in the World Trade Organization (WTO) amidst media smears and fears of gas supply interruption against the small Baltic state. Russian President Vladimir Putin urged Ukraine to weigh carefully the benefits of joining Russia's regional trade bloc against its plans for closer ties with the European Union on a visit to Ukraine to attend a religious festival. The European Commission yesterday (27 March) launched a scoreboard to compare the justice systems of member states in a bid to assess how courts can affect economic growth. Ahead of parliamentary elections, Kostiantyn Yelisieiev urges the European Union to strengthen its economic and political ties with Ukraine. Where are you going, Ukraine? For experts and analysts, the new year traditionally begins with the definition of the main trends of social, political and economic development. Actions in Ukraine show that some trends will have significant implications for the Ukrainian society, argues Lidiya Smola. Hopefully the process of European gas export to Ukraine this year will increase to the announced level because this will be a concrete, serious step to reduce Ukraine's Russian gas dependency, writes Roman Rukomeda. Ukraine, one of the world's most energy-intensive countries, needs to push for greater savings, with one official saying Kyiv needed "propaganda and popularisation" of green technologies. Failure to enlarge harms NATO and emboldens President Putin, argue Dr Liam Fox and Sally A. Painter.